His Highness Sheikh Hamdan bin Zayed Al Nahyan, Ruler's Representative in the Al Dhafra Region, visited the Barakah Nuclear Energy Plant to witness the latest construction milestones and receive a briefing on progress of the UAE Peaceful Nuclear Energy Program. His Highness Sheikh Hamdan was hosted by His Excellency Khaldoon Al Mubarak, Chairman of the Board of Directors of the Emirates Nuclear Energy Corporation (ENEC). H.E. Major General Mohammed Khalfan Al Romaithi, Commander-in-Chief of Abu Dhabi Police and a Member of the Executive Council of Abu Dhabi, H.E. Eng. Awaidha Murshed Al Mara, Chairman of the Department of Energy, Member of the Executive Council of Abu Dhabi and ENEC Board Member, H.E. Staff Major General Pilot Faris Khalaf Khalfan Al Mazrouei, Chief of the General Authority for the Security of Ports, Borders and Free Zones also attended the visit. With four identical reactors being built simultaneously, the Barakah Plant, located in the Al Dhafra Region of Abu Dhabi, is the world’s largest nuclear new build project. H.H. Sheikh Hamdan received a briefing on the Barakah Plant from Eng. Mohamed Al Hammadi, CEO, ENEC, Eng. Mohammed Sahoo AlSuwaidi, Acting CEO, Nawah Energy Company, and Nasser Al Nasseri, CEO, Barakah One Company. The management teams highlighted that construction of the Barakah Plant is progressing safely and steadily. His Highness was updated by senior management on preparations for the operational readiness of Unit 1 as well as the progress being made on the construction of the other three units. During the tour of Barakah, H.H. Sheikh Hamdan met with some of the Emirati engineers currently working at the Plant. H.H. Sheikh Hamdan commented on the importance of the Barakah Nuclear Energy Plant to the UAE’s progress in diversifying and securing the UAE’s energy sources. His Highness praised the impact of the Barakah Plant and the wider UAE Peaceful Nuclear Energy Program in creating strong opportunities for local businesses and talented UAE Nationals from the surrounding communities. He commented on the important role young UAE Nationals are playing in the project to become the nuclear experts of the future. H.H. Sheikh Hamdan was impressed by the quality-led approach to the construction and commissioning of the Barakah Plant in line with the highest standards of safety, quality and transparency, which has made the project a role model for all new nuclear energy programs globally. “We continue to work diligently in cooperation with our Joint Venture partner, the Korea Electric Power Corporation (KEPCO), the UAE nuclear regulator, the Federal Authority for Nuclear Regulation (FANR) and international organizations such as the International Atomic Energy Agency (IAEA) to ensure every aspect of the UAE Peaceful Nuclear Energy Program is implemented according to the highest international standards.” H.E. Khaldoon concluded. The visit was also attended by Members of the ENEC Board of Directors H.E. Saeed Fadhel Al Mazrooei, and H.E. Mohammed Hamdan Al Falahi, and H.E. Khaled Abdulla Al Qubaisi, Chief Executive Officer, Aerospace, Renewables & Information Communications Technology (ICT) for Mubadala and Chairman of the Board of Directors of Barakah One Company. Teams from ENEC and its Joint Venture partner and Prime Contractor, KEPCO, have recently achieved a series of construction milestones on the units of the Barakah Plant. In 2017, the Reactor Containment Building Liner Dome section was installed and concrete pouring for the dome was completed on Unit 3, and the Reactor Containment Liner Plate Rings, Reactor Vessel, Steam Generators and Condenser were installed on Unit 4. Testing and commissioning activities are progressing steadily on Units 1 and 2. Construction began in 2012 and the overall completion of the four units is now more than 84% complete, with Unit 1 is now more than 96% complete. Once the four reactors are online, the facility will deliver up to a quarter of the UAE’s electricity needs, and save up to 21 million tons of carbon emissions every year. 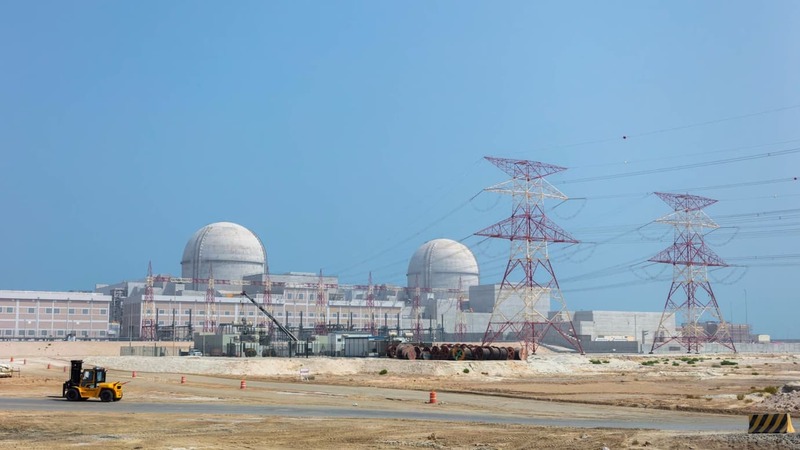 The Emirates Nuclear Energy Corporation (ENEC) is leading the development of the United Arab Emirates’ (UAE) Peaceful Nuclear Energy Program and building the country’s first nuclear energy plant. We are working to provide clean and efficient nuclear energy to the UAE – energy that is needed to support the country’s social and economic growth.